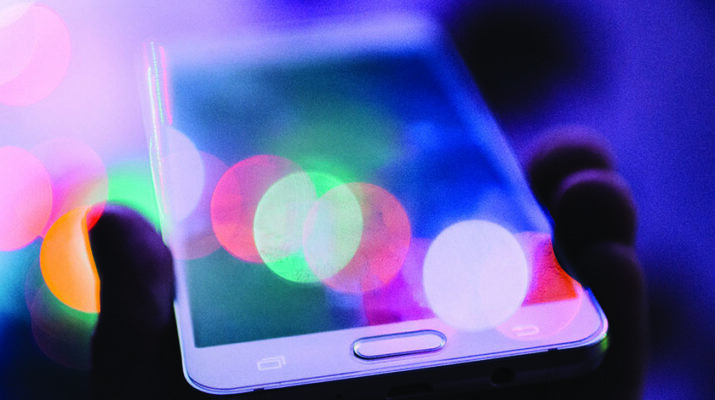 Social media is everywhere in the 21st century. Most people are constantly looking at various networks and using them to stay connected to friends and family, get the latest news or interact with their favorite celebrity. But it also has a relevant and meaningful purpose in education when used properly. 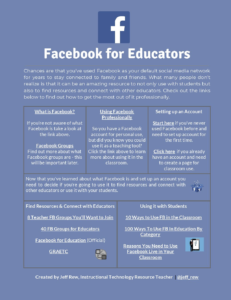 Twitter, Instagram, and Facebook are all filled with educators sharing ideas and resources. 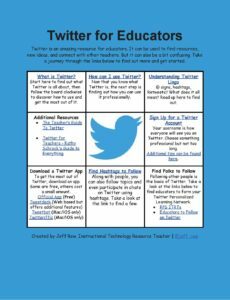 It can be a great way to expand your Personal Learning Network (PLN), engage your students in new and innovative ways and share the amazing things happening in your classroom. Keep personal and professional accounts / pages separate. Never follow or friend students or parents. Think before you post. If you wouldn’t say it in the classroom, you should not put it online. Know your school district’s policies regarding social media usage before starting any account for classroom use. Be careful of posting photos of students. Some districts require signed media releases from parents beforehand. Otherwise take photos from behind or edit photos prior to posting by covering faces with emojis. Many conferences now have a hashtag to use with posting from the conference (particularly used on Twitter). This allows folks that are attending as well as those not attending to easily find posts pertaining to sessions and follow along. For example, those attending the Virginia Society for Technology in Education annual conference recently used the hashtag #VSTE18. The ability to connect with educators, not just locally but around the the world, can help expand your personal learning network (PLN), provide a platform to share ideas and discover new resources to use with your students. It can provide a way to Inform parents/community/the world about the incredible things taking place in your classroom or school. 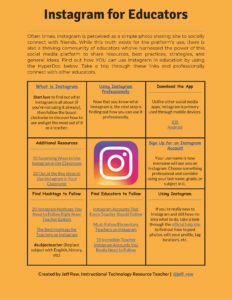 The use of social media can be immensely beneficial in numerous ways in the classroom – just be aware of and avoid the potential pitfalls. It has become a major influence and part of our lives, something that isn’t going away. We should be able to harness its power to help us improve our practice and learn from others. Jeff Rew has worked for Richmond City Public Schools since 2005. Prior to becoming an Instructional Technology Resource Teacher in 2009 he spent four years teaching high school Social Studies. He is a four time graduate of Virginia Commonwealth University and a Level 2 Google Certified Educator. He can be found online @jeff_rew. Text-Based Educational Experiences — So Great, It’s Spooky!